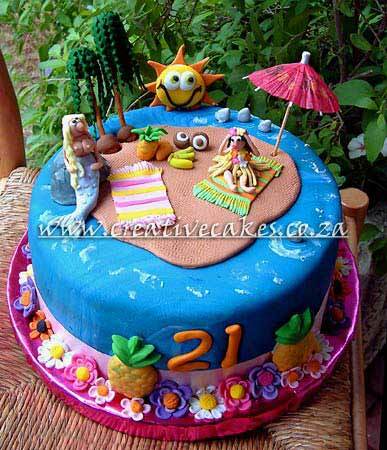 Anyone who is a beach girl will love the Beach Girl Cake. This girl's cake can be personalized to a fine detail. Including favorite pet, radio, or whatever is required. The options are always endless with Creative Cakes. Pineapple, palm trees, islands, sea, towels, suntan lotion, sun glassed, coconuts, plus a few sharks, can make this a delightful Beach Cake for any beach lover of any age.